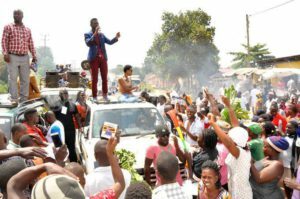 Singer Robert Kyagulanyi popularly known as Bobi Wine has been detained ahead of his last rally in Kasangati. The singer is reportedly in police custody at Kira Police Station where he was transferred after being briefly detained at Kasangati Police Station. Officers on ground say he is on preventive arrest. According to eye witnesses the melee ensued when President Museveni reportedly decided to address Hon Sitenda Sebalu’s rally at the same venue that Bobi Wine was supposed to address his.B y press time supporters were battling with police to have their candidate released. Today is the last day of campaigns for the Kyadondo East by-election. Voting is slated for tomorrow. The candidates in the race include Robert Kyagulanyi Ssentamu aka Bobi wine,Forum for Democratic Change’s Apollo Kantinti, NRM’s Sitenda Sebalu, Sowedi Kayongo (independent) and Muwada Nkunyingi, also an independent candidate. President Museveni is expected at Kasangati later today to campaign for the NRM candidate William Sitenda Sebalu while Dr Kizza Besigye is also expected to campaign for FDC’s Apollo Kantinti. Meanwhile, Mr Kantinti, one of Bobi Wine’s key opponent in the race has condemned the arrest, describing it as unfair treatment by the state.